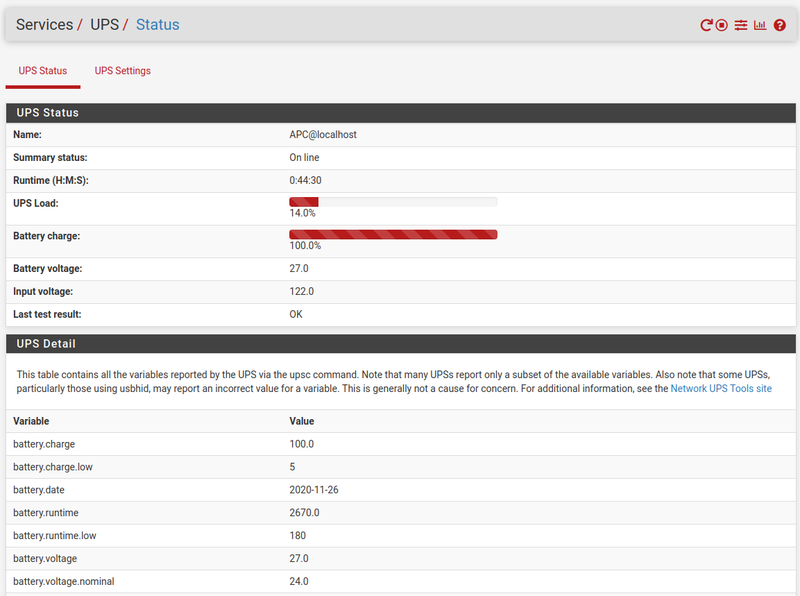 The NUT package provides a way to monitor an Uninterruptable Power Supply (UPS) using Network UPS Tools (NUT). After installation, the package may be configured at Services > UPS. The package does not have a lot of input validation in the GUI. If NUT will not start after configuration, check the System log (Status > System Logs) for log entries starting with nut:. The culprit is likely explained there, such as selecting a cable for a driver type that does not need (nor permit) the cable selection. Configuration errors will be displayed in the output if any are found. You can find a list of known issues with the NUT package on the pfSense bug tracker.